Wakfu is a Free to play Tactical MMORPG, developed by Ankama Games for Windows and Mac pltaform. In this free to play, casual MMORPG players emerge as a rising hero bringing hope to a ruined and ravaged world, a beautiful blend of manga cartoon graphics , humorous gameplay and tactical strategy combat in a completely unique world. 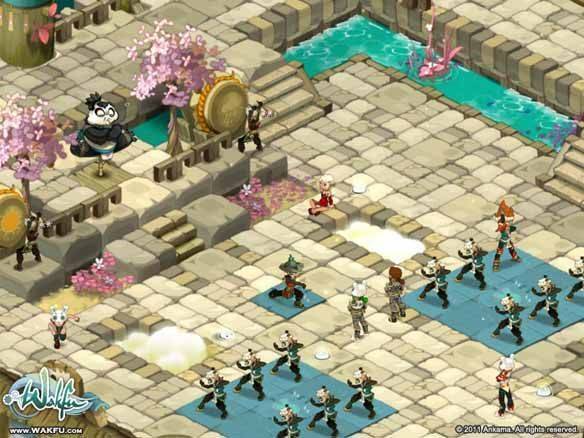 Wakfu enables players to be heroic adventurers, budding diplomats, renowned crafters and more. Raise your own Guild, become a model citizen a notorious outlaw as you advance your character in true MMORPG fashion. Players get to choose from 15 different classes including the protective Feca’s Shield, animal summoning Osamodas’ Whip, treasure hunting Enutrof’s Fingers, Sram’s Shadow assassins, Xelor’s Sandglass time magi, gambling warrior Ecaflip’s Coin, healing Enripsa’s Hands, stoic Iop’s Heart, Cra’s Range archers, plant summoning Sadida’s Show, Sacrier’s Blood berserkers, Pandawa’s Pint sherpas, The Rogue Ruse illustionary masters, the lunatic Masqueraiders and The Foggernaut’s Steam saboteurs. Each class has some mastery over 15 elemental spells from three of the four elemental pools (Air, Water, Earth and Fire) and their own unique class specific specialties which best to determine their role in combat. Each time a player kills an enemy with one of their characters and then that character will gain XP and slowly at level up, at each level character earns 5.2 improved their abilities and five points to improve their characters stats. Combat in Wakfu is turn-based, each turn lasting 30 seconds where players can move around the battlefield and cast spells. What’s players can fight solo it is much more beneficial to fight as a group, which can be made up of up to 6 players, with various different classes it is possible to create some very unique group combinations. Monsters will get increasingly stronger the more experienced your fighters become, but the greater the challenge the greater the reward. Players are able to engage in player versus player combat in friendly duels fighting for your Guild and your chosen Nation; players can earn citizen points by killing those players who have declared themselves as outlaws, however they will lose the citizen points by attacking players who are innocent. Players can head out into challenging dungeons to take down difficult bosses in search for loot and treasure or alternatively have a break away from combat and embrace the in-depth crafting system that is available with six available harvesting professions from miners to herbalists to 10 practical professions such as jeweller and tailor and even a unique “Karma Minter” profession that all players lured to give people in game currency.